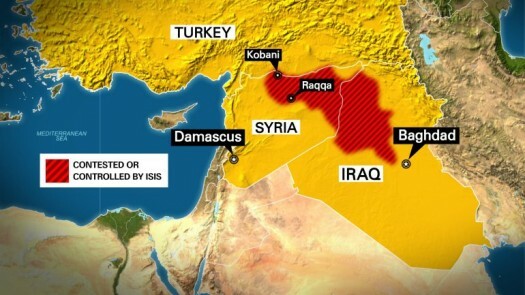 This map highlights the countries of Iraq, Syria and Turkey. Called out are the cities of Mosul and Kobani. The area of ISIS controlled or contested territory is highlighted in red. Four Islamic State suicide bombers blew themselves up in the Syrian Kurdish town of Kobani on the border with Turkey on Saturday amid clashes that have killed at least 30 fighters, a monitoring group and a local official said. Kurdish militia have been holding off Islamic State fighters for more than two months in the town, known as Ayn al-Arab in Arabic. Neither side has been able to gain a decisive advantage despite U.S.-led air strikes aimed at pushing back the Islamist insurgents. The Britain-based Syrian Observatory for Human Rights said four Islamic State fighters blew themselves up in suicide attacks – one with a car bomb at the border crossing at dawn, a second with an explosive vest in the same area, and two more on the southwestern edge of the town. Idris Nassan, a Kurdish official in Kobani, said the first car bomber appeared to have crossed from Turkey and exploded at around 0400 GMT, killing two people and injuring others. “They also attacked with two cars in the south but (Syrian Kurdish fighters) destroyed them before they reached their targets,” he told Reuters by telephone from Kobani. A Turkish official had no immediate information. The Observatory said clashes had broken out throughout the town itself including along the southwest front. It said Islamic State fighters had launched at least 110 shells into Kobani and were bringing in tanks. Two air strikes had targeted Islamic State positions in an industrial area in the east, it said. At least 30 fighters have been confirmed as killed so far, said Rami Abdulrahman, the Observatory’s director. Twenty-one of those were Islamic State fighters, including the four suicide bombers. The rest were Kurdish forces. Quick. Send them more vests with big pockets.